These sweet corn muffins are a little sweeter than regular corn muffins, and they're also lighter and more tender. Ordinary cornbread typically calls for half flour and half cornmeal. But for these sweet corn muffins, you'll use three parts all-purpose flour and one part cornmeal. And the way to measure, of course, is by weight. Which means you'll need a digital scale you can set to grams. 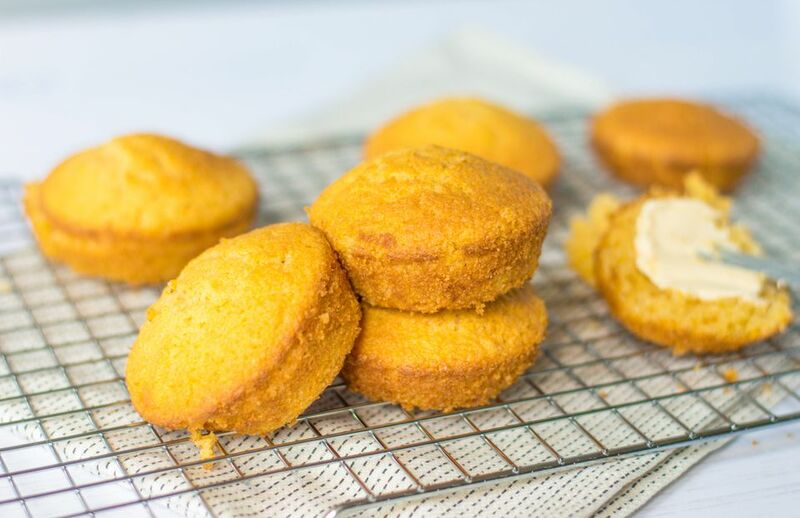 Sweet corn muffins aren't traditional everywhere, but if you sometimes have a craving for a sweet corn muffin, this recipe is for you. A rugged, rustic ​corn muffin wants to be savory, but these light, tender ones just beg to be sweetened. Finally, remember to use fresh baking powder. If it's older than six months old, it won't provide enough rise. Combine the flour, cornmeal, baking powder, sugar, and salt in a large bowl. In a small microwave-safe bowl, heat the butter in the microwave for about a minute, until it's thoroughly melted. Or you can just melt it in a small pan over very low heat. Set the melted butter aside at room temperature to cool, but don't let it solidify again. Thoroughly grease and flour a 12-cup muffin pan (or skip the greasing and use paper muffin liners instead). Add the liquid ingredients to the dry ones and mix just until the liquid is incorporated. You'll still see a few lumps. But that's fine because mixing too long or too vigorously will cause the muffins to turn out hard. Carefully spoon the batter into the prepared muffin pan (you can use a small ladle or even an ice-cream scoop) and transfer to the oven immediately.